It’s easy to see how geometry plays a part in the ordering of patterns in Nature. From the spiralling of water as it flows down a drain, to the spiral of an unfurling leaf, the spiral arrangement of seeds in a sunflower, and the spirals of stars that form the Milky Way, Nature uses a limited range of patterns to distribute matter and energy across space. Despite this limited range of patterns, they are expressed in so many and varied ways. The hexagonal arrangement of walls in a beehive divide space into characteristically regular voids. The hexagonal arrangement of ice crystals in a snowflake, divide space into an infinite number of characteristically irregular shapes. While no to snowflakes are ever alike, their infinitely varied arrangement of crystals all conform to the same simple geometric pattern. It is harder to see how geometry can be used to create a well proportioned design, that on the surface, does not even hint at it’s geometric origins. 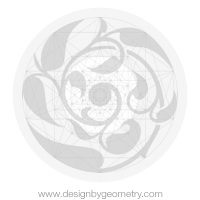 Just as it does in Nature, geometry can imbue any design with a sense of harmony. If well understood, it can also be used to ensure the complexity of any design is handled in an orderly and harmonious fashion. It is from the observation of natural forms and processes of growth, that structural similarities and differences can lead to the revelation of relationships and patterns, and in turn useful principles that can be applied to design. The purpose of this website is to share what we know about geometry and it’s usefulness to design. Back in the early 1990′s Chris completed a Master of Philosophy (Architecture) at the University of Auckland. This involved the study of proportional grids and their use in historic architecture. The study focused on ornamentation, the structural elements they adorned and their geometric relationship to the building as a whole.